Currently browsing articles with a topic of "blue moon". If there is ever a season when it’s necessary to pull out all the stops in order to catch nice striped bass in the Chesapeake Bay, it’s late summer. There are plenty of small fish to be caught, but getting the bigger ones takes a lot more effort. 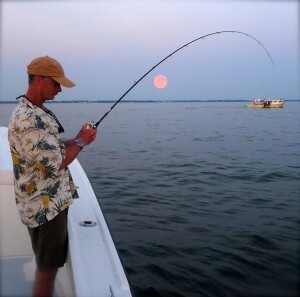 In my presentations this year, I’ve advised fishermen to take what they know about the five reasons why striped bass bite – hunger, reaction, competition, territory, and curiosity – then consider the five senses fish employ when feeding – sight, smell, sound, feel and taste – and fashion their fishing techniques to maximize their chances. In other words, 5 X 5 = success. When fish are hungry and feeding aggressively, they’re easy to catch. Fishermen who are lucky enough to find a school of hunger feeding fish blitzing beneath screaming birds are certain to be successful, no matter what kind of lures they use. Unfortunately, it’s not easy to find bigger fish feeding on the surface this time of year. I’m very envious of the few fishermen I know who have the time and money to chase blitzing rockfish all up and down the East Coast. 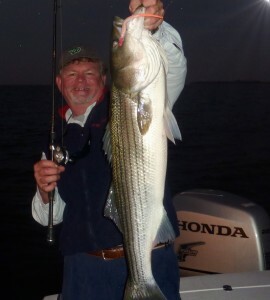 Since most of us have to go fishing close to home in the limited time we have available, we have to look diligently for the few good stripers that might be around. When we’re lucky enough to find them, we usually have to work hard to convince them to take our lures. Sometimes, they just don’t want to bite. Read More! I guess you could say my wife and I met on a blue moon. It was at least a rare occasion, one that I’ll never regret because, among other great things, it ultimately led me to the Chesapeake Bay. There’s some discussion about what makes a moon blue these days. The modern interpretation is that the blue moon is the second full moon in any given month, but there’s an older interpretation I like better. There are normally three full moons in each season whether spring, summer, fall, or winter, but sometimes, rarely, there is an extra full moon. Farmers and fishermen who plan their lives by the seasons refer to the usual full moon cycles in a three-name seasonal sequence – for example the early summer moon, mid summer moon, or late summer moon. The late moon is always the last of the season, so when that rarely occurring extra full moon comes along, it is left without a name. We call it the blue moon. That makes tonight, Sunday November 21st the blue moon of fall 2010. You can read more about it in this Space.com article. Since the phases of the moon drastically influence the tidal currents in the Chesapeake Bay, I pay very close attention. Read More!